Lords of Death and Life review, the short version: Xeric winner. 'Nuff said. 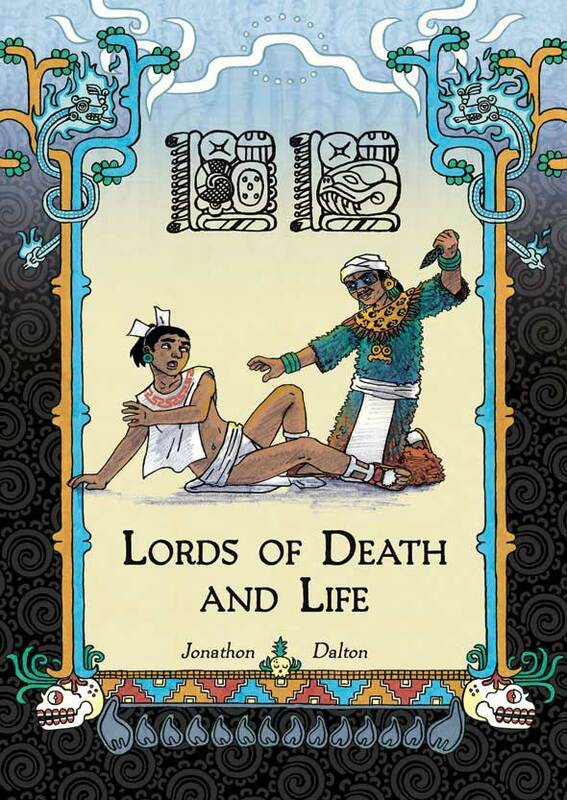 Lords of Death and Life review, the long version: Jonathan Dalton actually produced the story (primarily) between 2006 and 2008, serializing it online. He then sold it as a hand-crafted, accordion-fold piece. That was, not surprisingly, a lot of work so he published it as a 'regular' book with the help of a Xeric grant. Now, if you've read this blog for any length of time, you'll know that I'm a sucker for Xeric winning books. But some I do make a greater effort to seek out. Such is the case with Dalton's book. The story is about a Mayan named Mol Kupul. Though he lives a content life with his family, he has repeated visions of a strange being enshrouded in a blue flame. He travels to the city of Xicalango to see if he can find someone to explain these dreams to him. He's accidentally caught in a riot and taken captive by some Aztecs, one of whom tries to kill him to release his companion spirit. Mol's escape attempt is thwarted, and his spirit is released revealing itself to be Xiuhcoatl, the creature from his dreams. One of the Aztecs tries coercing Xiuhcoatl into attacking the king and, while he does get into the palace, refuses to attack the ruler. The Aztec then reveals his spirit to be Tezcatlipoca, god of sorcery and dark fate. His intent is, in fact, to instigate an war between the Aztec and Maya, hopefully obliterating both. I'll leave off there, to encourage you to read the whole thing for yourself. This is one of those books which reads much better in print than online. The artwork online comes across as fairly harsh in places, but the printing process mutes that harshness enough to make it feel more natural. You know how the colors of an Golden Age comic book look when printed on new, bright, glossy paper? That's the kind of difference I see here as well. Setting aside Dalton's additions to the print edition, the coloring pretty clearly indicates that it was meant to be read in print. I must admit that I have a mild interest in the Aztec and Mayan cultures, which was one of the reasons I made a point of tracking this book down. Both cultures are largely overlooked here in the U.S. despite being very socially wealthy and impressive societies. In fact, they were so looked down upon that the anthropological definition of "civilization" was altered repeatedly to specifically exclude them. And I think that, because of that, it will make this book a little harder for people to pick up and get into. First, because we as a society have passed over their histories, we're largely unfamiliar with how their language even looks and feels. We're familiar enough with, say, French or Japanese that we can understand naming conventions and styles. While Nicolas Sarkozy and Naoto Kan might not be household names here in the States, we're comfortable enough pronouncing and repeating them. But, since the Aztec and Mayan cultures were all but obliterated, names like Tenochtitlan and Popol Vuh seem more like randomly assembled letters than actual words. Even having studied some of this in college, it still took me a bit to pick up on Dalton's use of the Mayan calendar throughout the book. Dalton does recognize this and has an illustrated glossary in the back. Definitely very useful. But, if you're like so many other close-minded Americans (which, if you're reading this blog, I really hope you're not) that won't be enough to overcome the not insignificant cultural barriers. And that would be a shame. The book is really well-executed and thematically, I would think, appeal to people who like superhumans battling it out in a good-sized metropolis. As one of the comparatively few comics tackling Aztec or Mayan ideas, I think it definitely stands out in that regard and I hope encourages others to try bringing some of those cultural elements into their works. Dalton's work is really enjoyable, and I hope that "weirdness" of using some non-Western touchstones doesn't deter too many people from checking it out. Lords of Death and Life is available from the author for $10 here.